Recently, I decided to make something super colorful, because it's been a difficult summer. I was in a car wreck a couple months ago, and while I was uninjured, my mental health took a serious blow. Every time I get behind the wheel now, I have to shove aside serious anxiety. Anxiety which, unfortunately, isn't limited to driving, or to the awkward social interactions it clung to before. That empty burning sensation fills my guts with just the slightest provocation now, and it's been pretty exhausting. But when I think about it, I realize that everyone has gone through times when it feels like everything in the world is rushing at them, eager to trample. Back in December, I sketched up this idea for the silhouette girl and posted it on Instagram, looking for ideas of what she could be "conducting". A couple of the possibilities I suggested included a swarm of bees, a herd of wildebeests, or a fireworks show. My faithful friends suggested ocean waves, mountains and rivers, emotions, and a thunderstorm. I couldn't decide, and soon the sketch was lost in the hubbub of the holidays. I've only been working part-time recently, and I've had a lot of time to sort through my stuff and try to purge a lot of things I don't need. I've filled two trash bags full of clothes and shoes to donate, I've filled more bags full of other junk to throw out, and I've tried my best to organize my stuff. In that process of organizing, I came across the conducting silhouette sketch again. I scrolled through my Instagram account to see what those suggestions were, and my own casual idea struck me - wildebeests. In truth, I loved the other suggestions and I think each of them would have made an awesome piece of art. Maybe I should make a series of just the conducting girl! But the wildebeests caught my imagination. These two attributes are what I wanted to explore in this piece. I still might do some last touch-ups, especially on the main wildebeest. I spent several years drawing horses almost exclusively, and there's enough similarity that these raw, harsh, wild antelopes pull my hands into the familiar equine lines that became almost second-nature to me in middle school. I actually considered making the scene with a herd of wild horses, but the raw power of a herd of wildebeests was irresistible. I mean, we've all seen The Lion King. We know the power of that herd instinct. We know that even the fiercest lion can be overcome by the thundering hooves of antelope. And there's something so other about them. Not a hint of domestication. Wildebeests are no favorite among small children, they're not romantic or chivalrous. They're simply wild. They're thin and tough, with scraggly beards and knobby knees. They're sketchy characters. Like I said earlier, I wanted to make something wild and colorful, against my drab, anxious summer. Part of the fun of making this piece was trying a new medium. I'd seen plenty of online tutorials showing how to make a watercolor effect using sharpies and rubbing alcohol. So, I gave that technique my own spin! Here you can see the first drawing, using red, orange, purple, blue, yellow, and gold sharpies. With the help of a few source photos from our friend Google, I soon had a scribbled version of what I was going for. A paintbrush and alcohol gave me this rich "watercolor" version. The gold sharpie didn't blur much, but I actually like the effect. I especially wanted the main wildebeest to stand out really well, and I love how the orange, red, and purple sharpies blended into this fierce red. I honestly thought about leaving it like this, without the silhouette girl, but she's the whole point of the piece. Without her, it's just a drawing of some animals in funky colors. You may be facing a thundering, murderous herd of stress, anxiety, money problems, illness, broken relationships, and life circumstances. 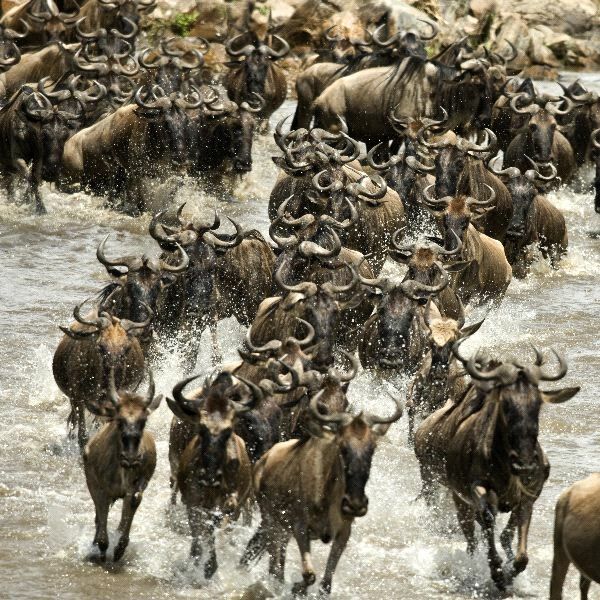 These "wildebeests" may be trampling everything in their path, a blur of raw, knobby-kneed power. A mass of pure wildness surging toward you. 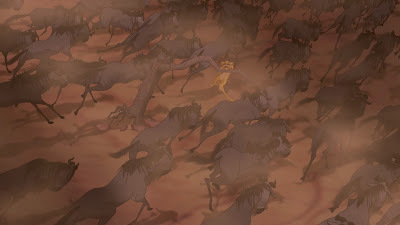 But if the silhouette girl can conduct this herd like a symphony, surely you and I can face our own problems, too. around the girl and the wildebeest's face. Keeping with the ongoing theme of innocence struggling against the impossible, the Wildebeest Girl is also something new and different. For once, she's using a tool for her purposes. Is it a conductor's stick, or a magic wand? Being a Potterhead myself, I can't help wondering what Hogwarts house she would be placed in! I've always tried to keep the silhouette girl a little ambiguous - is she facing the viewer, or the obstacle? Is she happy or sad? But for this one, I want to make it clear. There is no magic here, at least not in a "Harry Potter" sense. Wildebeest Girl could just as easily be called Orchestra Girl or Conducting Girl. We can't solve our problems with magic wands. What we can do is choose to see our problems as something with which to make a beautiful song of bold perseverance. Final Wildebeest Girl; August, 2017. Sharpie markers, alcohol, gouache, India ink, and acrylic on canvas. 12"x14". You have a way of reaching my heart and sharing peace. Wildebeest Girl is remarkable!